So sorry for the silence of late, but I have been busily preparing for my first gun show. Admittedly, it will not the the first gun show that I have ever attended, just the first one that I will have a table. In reality, gun shows and I are tight. My dad has always loved them, and as children, my brother and I spent a considerable amount of time wandering in gun shows from table to table. When I was growing up, my dad was the proprietor of a little country store. He sold grain, tack, used furniture and army surplus, not to mention anything else he thought might sell. He issued hunting and fishing licenses, rented videos and sold guns. He built a woodstove (in the shop at the high school where he taught), which heated the building and there were tables and chairs surrounding the stove. We had a bakery case full of doughnuts and sundry other eatables and the coffee pot was always full. Dad's store served as the local meeting place. The troubles of the world were hashed out around that wood stove as the coffee flowed. Deals were made, necessities purchased and small town life was lived, all within the confines of our little store. Going to gun shows remind me of my dad's store. The smell, the people, the fiercely independent streak brings me back to the days of my past. I remember digging through musty boxes full of surplus, making sure the contents were not past their usefulness. I remember cartons full of packs, pouches and belts, some from our military and some (ugh!) the Germans. I, of course, could spot the difference in an instance - knowing full well that ours were quite superior. I remember wearing military wool pants to school in the winter time trying to start a fashion trend and thinking it was normal for people to wear military blouses as jackets. When I would get homesick, after moving to Seattle, I would frequent a huge Army/Navy surplus store on 1st Ave. I would walk past bins full of mag pouches, feeling each one. I would look at the dummies sporting gas masks and finger the wool blankets with the medical symbol on the corner - and I would feel like I was home. I would bury my face in the piles of BDU's and breath deeply, and I would think of my dad. Now, as I walk past table after gun show table, trailing after my husband, I am reminded of my childhood, trailing after my father. I feel the mag pouches, finger the blankets and feel like I am home. Soon, I get to have my very own table! I am going to be at the Spokane Gun Show next weekend (11/4 - 11/6). We will have books (The Prepared Family Guide to Uncommon Diseases), pads (Naturally Cozy) and miscellaneous gun stuff. Yes, I know, with pads there, all of the guys will be in a hurry to hang out at my table! My dad is coming to share a table with me (I'm so excited!) and Maid Elizabeth will help run the booth. I would love an opportunity to meet any of you folks that are in the Spokane/Coeur d'Alene area. 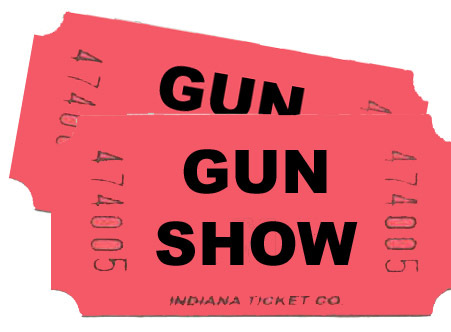 If you find yourself at the gun show, I will be there Friday, Saturday and Sunday. Stop by and say Hi! We get frequent gun shows down here in my part of Texas. I really enjoy talking to the old guys (most of which are fellow veterans) at thier tables about old WW2 1911's and other guns. I have been buying silver as of late, just junk silver. I buy from one Old Cowboy who gives really good deals on silver quarters and dimes. Its nice knowing in time I will be one of those old guys. How wonderful for you that you have the opportunity to share some time with your Dad. Sounds like good memories! Enjoy!! What a great opportunity of savings for persons to be able to purchase your very comfortable products, and your awesome book, that No home should be without, and pay no shipping costs! Any woman would love to receive any of these as a present. Your newest, larger, incontinence pads work equally well for men too. I will be praying that you break your sales records! And, that you enjoy meeting many new people there. There is a very distinct odor to military surplus, specially military surplus electronics-nothing else has ths odor. I'm told this is a fungicide/corrosion inhibitor,but I'm not sure on that point. Industrial surplus electronics doesn't have the same odor. A local surplus place carries military surplus of several countries,and U.S. stuff is by far the highest quality. I have an old Army medical bag that I have been using as a tool bag for alomst 30 years,and it's still just fine. And hand grenade pouches are good cell phone holders. Good luck with your table..I'm a couple thousand miles or so away, or I'd stop by. How great to remember your dad and the things you did with him. I am going back to my childhood in pictures, of the great train station my grandparents live at when my grandpa was a co-station master, in the Copper Range of Upper Michigan...Yep, I am a Yooper!! EH!! Good luck with your booth. Hope you do well. I have SUCH a silly question. Why do you refer to your home as "shouse"? It's not such a silly question at all. We call our home a "shouse" because it is actually a shop that we have turned into a house. That's all there is to it! Oh fantastic! I met Patrice at her Costco book signing and I think I'll try to make it to the gun show. I will get to meet both of my favorite North Idaho bloggers! Thanks! I was wondering and I just could not come up with anything. lolol! My curiosity has been sated. How did you do at the gun show? Did you sell lots of hygiene products and piles of your book? Did you buy anything interesting? did you commute to the show or stay in a travel trailer or with friends? I have a bunch of mantiques that I need to sell. Maybe having a table at the next gun show is something I should contemplate. I know it would be fun. Thanks for the inspiration, Enola. It was lovely to meet you and your family! Please give us a rundown on how the gunshow fared?